With special thanks to contributor Drew, it has come to our attention that the $SPX:$VIX ratio is now at an all-time high. I had written articles previously about the S&P 500 as if it were priced in units of the $VIX but in all honesty I had recently taken my eye off that ball. So I really appreciate the good fortune to have stumbled upon Drew's comment this morning and for paying attention to what he had to say. 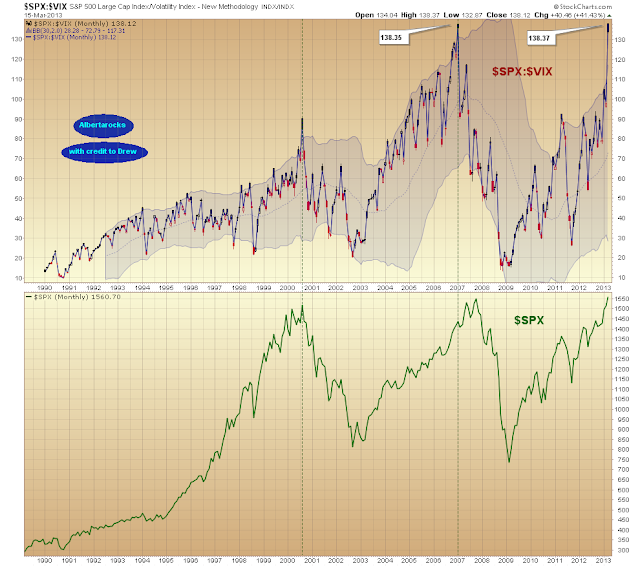 The previous peak in this particular ratio had occurred in January 2007 when the ratio topped out at 138.35. Of course at the time we had no way of knowing whether or not the investing community was going to become even more complacent or whether that was the actual apogee of that ridiculous curve. As it turns out it was the peak, and nine months later the equities markets began their epic crash into the lows of March 2009. Today, complacency has reached a new level. Never before have investors been so convinced that a market pullback is all but impossible. Caption edited since initial publication: Click here for larger updating version. The ratio has adjusted almost immediately, mostly from an explosion higher in $VIX. And finally, I'd like to add one more touch here. In the chart below I've set the standard deviation setting to on the Bollinger bands to the point where the $SPX is just touching the upper band. Amazingly, the $SPX:$VIX ratio on a monthly basis currently resides 2.94 standard deviations above the 30 month moving average. Right click chart for option to open in a new tab for a larger view. Just so that we appreciate how extreme this degree of complacency is, it behooves us to recognize that in the standard normal distribution Bell Curve, 99.7% of events will fall below 3 standard deviations. The ratio is currently at 2.94 standard deviations. There's not much else to say. The pictures speak for themselves and the only thing we know with 100% certainty is that the snap-back to reality will be violent. We do not know when that will happen but if you are long this market it might be a good idea to take a little off the table PDQ. Doncha think? Be careful out there and until next time... stay safe. Nearly a year ago we took a fairly close look at the AAPL:$NDX ratio in which we demonstrated that any time we saw that ratio falling, the NASDAQ 100 simply had to follow suit. And vice versa. And of course that made perfectly good sense since AAPL represented an incredibly large chunk of the $NDX. With one single corporation representing approximately 20% of an entire index rising or falling, it logically follows that the entire index must do the same. How could it not? The entire point of following a ratio of this type is to try to use it to our advantage in spotting a likely turning point for the larger index. And ever since that short article was written, the $NDX has indeed followed the ratio loyally. Incredibly, that metric came to a screeching halt on Jan. 1 of this year. So now we're faced with a real dilemma. First of all, let's try to ascertain why the ratio has totally broken down as an indicator. When did the breakdown occur? Well, as clearly evident on the chart above, on the first trading day of this calendar year something happened that completely shattered the myth that "leaders lead". How in hell is this possible? What happened on that day? Well for one thing, that was the first trading day that followed the eve of the Congressional Comedy Show, the night when the world held it's collective breath as a human form of "leaders who don't lead" did little other than to bathe in the global limelight and the sheer glory of their own presence... and then did nothing. For those of you who have already forgotten what a silly and unnecessary piece of low quality drama that was, here's how the Guardian recorded it. What followed on the next trading day was a rocket shot in equities markets heard around the world. Does anybody know why that happened by the way? To me it would have made more sense if global markets had tanked when the non-leaders of the largest economy in the world made the deliberate decision to bankrupt the nation. And here we are now, just two short months later and that decision has effectively been reversed. Spending will be cut. Not enough, but it's a start. So the most obvious question then should be "Is the fact that "the deflationary budget cuts are going into effect" going to fix what is wrong with the AAPL:$NDX ratio?" After all, sequestration is the direct opposite of the event that was used as the excuse to launch the markets on Jan. 2. I don't know the answer to that question, but the logical conclusion would seem to be "yes, the correlation between AAPL and the NDX should once again become direct and nearly instantaneous as it had always been prior to the contrived equities launch of Jan. 2." That's not to say it will necessarily happen though since the global banking cabal seems to have patented the rights to logic and banned its use until further notice. A page right out of Monsanto's handbook. Nonetheless, we do our best to work through the smoke and mirrors. So why did the ratio break down? What would be required for it to break down? In order to try to get a grasp on what effect AAPL's recent performance has had on the $NDX, I turned to a little calculator I devised on Excel a couple of years ago that can provide those answers reasonably accurately. I say "reasonably" because we're never certain what weighting to give AAPL as a percentage of the entire NASDAQ 100. The last figure I read said that AAPL comprised 19.8% of the entire $NDX, and of course as the value of AAPL drops, so does its weighting. So for the sake of this discussion I used 16% since AAPL has declined considerably in recent months. The results show that had AAPL behaved just since the first trading day of this year exactly the same as the other 99 companies in the $NDX had done, the $NDX would have closed on Friday at approximately 2855 instead of 2747.75. Let's round that off to 107 points difference. ...continue toward getting some answers. So what's next? 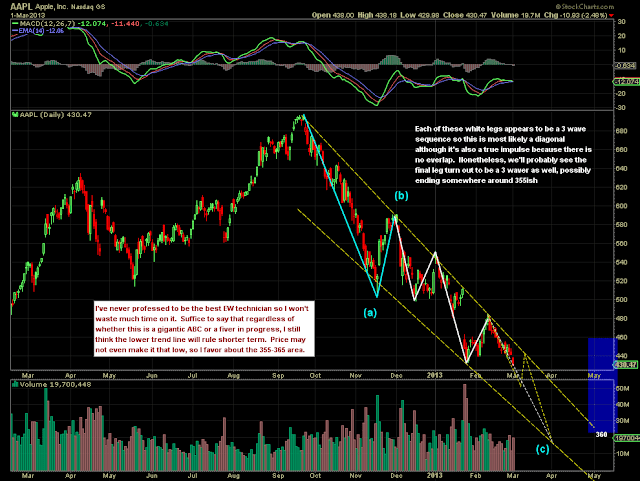 Is the decline in AAPL complete or near completion? I do not believe it is. 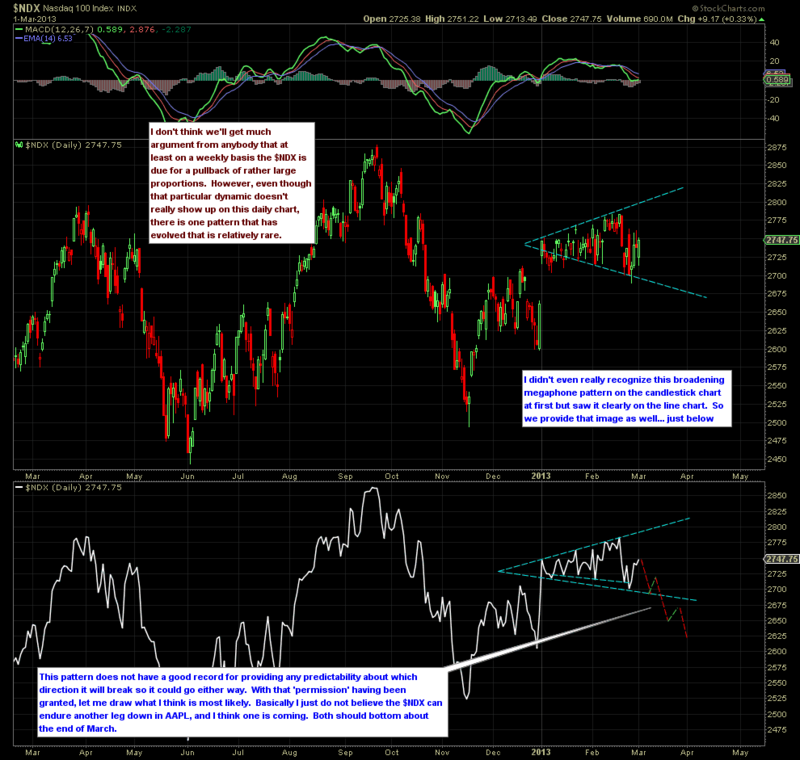 If not, what does that mean for the overall $NDX going forward? And perhaps most importantly, what would be the result when AAPL does find a bottom and comes roaring back with a vengeance... even if it were only a snapback corrective rally in a larger cyclical or even secular downtrend for AAPL? 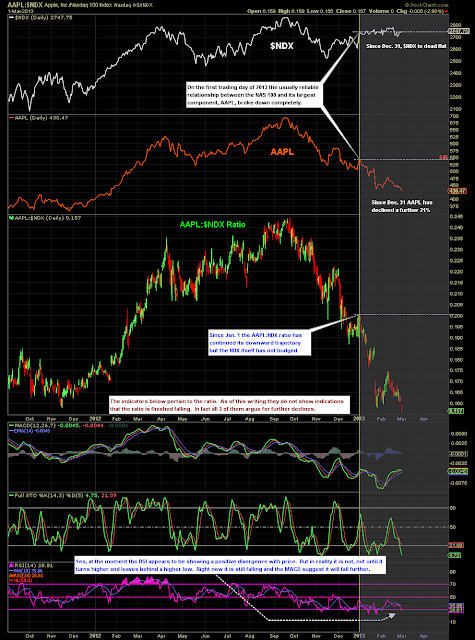 The recent record suggests that if AAPL finds a bottom before the $NDX decides to play catch-up, the rally that would be ignited in the NAS would likely be spectacular. Would it rise as much as AAPL will? Absolutely not! Would it rise at least to a certain degree along with AAPL? Definitely! 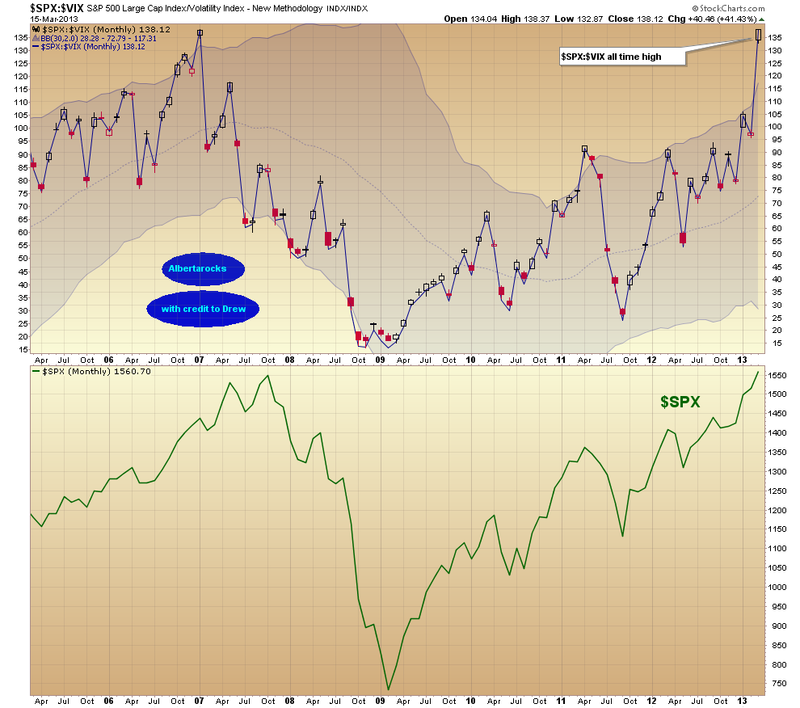 Will those events finally turn the AAPL:$NDX ratio higher thereby granting the green light for new highs? Yes, the ratio would obviously turn higher but it would almost assuredly just be a bounce. For our immediate trading needs though, we don't have to have the answer to that last question just yet. But sure as the sun will rise tomorrow, at some point we will! So we'll be keeping our eyes open for these signals because sure as shootin' they're coming, although it seems they're perhaps three or four weeks away. I think there are two keys to the daily chart of AAPL. Firstly, the pattern that has emerged since day one of this year has evolved as a series of 3-wave sequences (white). Those are the hallmarks of a diagonal. Usually there is overlap between wave 1 and wave 4 in a diagonal but the AAPL case is a bit of an anomaly I think, because although all the white waves are 3s (including the two down-legs), there is no overlap. Nonetheless it is an impulse that certainly seems to need a 5th leg lower. 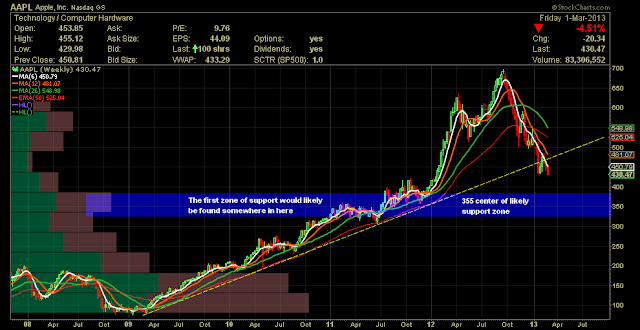 Again, as seen on the weekly chart for AAPL, the daily also shows the area of 355 as being a reasonable target. A second and important key to the AAPL's daily chart is that none of the indicators are supporting the idea of higher prices at this point. So let's go with a price target for AAPL of $355 before we're likely to see any reasonable bottom. And finally we'll investigate what the future might hold for the $NDX itself. Without even bothering you with a weekly chart, I'll just summarize the situation with a comment that all you bright readers are already aware of... the $NDX along with all the other majors are way overbought on a weekly bases complete with negative divergences on all fronts and they are due for a pullback. As well, the sharp leg down off the September top in the $NDX was an impulse while the current up-leg, at least at this stage, seems to be a clear corrective. In a normal world there would be little argument (not even from the most staunch bulls) that another down leg is now most likely. We should be seeing either a 'C' leg lower or a wave 3 at any time now. In his highly referenced library of chart patterns, Thomas Bulkowski describes the "Reverse Symmetrical Triangle" here. One of the requirements for a proper triangle of this nature is that it be made up of 5 legs, each one of them itself being a 3-wave sequence. On the chart of $NDX it is difficult to discern those five 3-wavers. But if you recall from the daily APPL chart, in that exact same time space APPL does indeed display what looks to be four of the five required 3-wavers. This fact makes it even easier to accept that what we are looking at in the $NDX is indeed a legitimate bearish broadening triangle. Mr. Bulkowski also goes on to note that this pattern is not very good at providing guidance about which way it will break out. But Dr. Robert McHugh is quite vocal about these patterns being very bearish. I fully concur with Dr. McHugh in this regard for the following reason; psychologically speaking, I interpret the ever-widening swings as betraying ever-increasing skittishness, indecision and fear as time moves forward. This is the exact opposite psychology present in a regular symmetrical triangle where price moves toward the triangle's apex to the right. 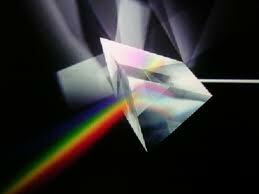 In other words, in a regular symmetrical triangle, investors are becoming less and less fearful as time progresses. 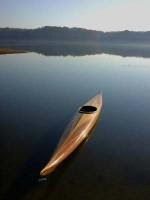 The individual movements up and down decrease in size as each day ticks by and fear dwindles. It's no mystery that it's during these very types of patterns that the $VIX drops to levels that just scream "Complacency!" So it seems perfectly logical that that's why symmetrical triangles almost always break out in the same direction that price was headed when it entered that triangle, especially when the larger trend is to the upside. They even display that behavior to the downside in cases when the overall sentiment was bearish as price entered the triangle. As time progresses in a regular symmetrical triangle those bears become increasingly comfortable that they had made the right decision. And in decades past, before the banking slobs were permitted to come swooping and mess with normal market forces on an hourly basis, the dependability of the symmetrical triangle in a bear cycle was just as reliable as it was in the bullish phases. So almost by default, I'm quite convinced that the broadening triangle displays behavior diametrically opposed to the psychology of comfort and calm found in a regular symmetrical triangle. Broadening symmetrical triangles are bearish. To sum it up then, I think the huge disparity between AAPL and the $NDX, as revealed by the ratio between the two, is about to be resolved. I'll stick my neck out here and call for a rather harsh pullback over the next 3 or 4 weeks in all the major indices, with AAPL continuing to fall considerably harder than the $NDX does during that period. And the ratio continues to drop. I do so because I still believe in technical analysis, especially when it offers clues about overall market psychology on a scale as broad as this. And right or wrong, I simply interpret the market action since Jan. 2 as having been corrective and illusory. I believe that will be proven correct as the ratio has revealed a rare market extreme that simply cannot persist. Wishing readers all the best... and stay safe!